Recently I've been taking in a female perspective of their own body image and in the same time compare it with what guys would think whenever they look themselves in the mirror. Coincidently, I found Debbie's post on the same issue and figured that her take on weight really is interesting. For every man that has ever been with a woman, we know the obsession of the female persuasion to losing weight. However, lately we've been spotting people who convince themselves that they are overweight so much that they are willing to shed the pounds to the brink of starvation. Question is, why? Perhaps it is the fault of the social stereotype, that no one would be able to look good with too much meat on their bones and with this reason, women is now left with the convincing idea that the skinnier a woman is, the more attention that the girl would get from men. Let me be the one to say this, for the sake of preference of many men out there, that we would prefer girls that are curvaceous than a skinny, stick insect of a woman any time of a day. Personally for me I would rather have a woman who has a good appetite than a half a bowl of salad eating giraffe anytime of the day. I know for a fact that women suffer to make themselves look thinner than they ever before and I don't understand why. In the end of the day, one would try to make themselves look better by hating life itself. Fact, this situation is the same for men. We too are conscious about how we look and believe me when I saw this, its harder to strike a balance between being too thin and being too fat. Trust me when I say I know this, the last thing you want is to either look like that skinny weak dweeb or the oversize panting man chasing after his runaway donut. If any of the women out there feels that its easier for men, think again. So, where's the target here? Slight hint: Just be normal. Its perfectly fine for wanting to keep yourself fit and enjoy the goods of life in the same time. Check with the doctor to keep track with what is healthy, keep a balanced diet, work out more often and perhaps for one, evaluate the way you look with those who would actually give you an honest answer. As what they say, too much of anything can never be good. Do check out Debbie's on this matter to see what she thinks. As for those out there that has the point on this matter, share it with me and let me see what you think. Nang if you like the post guys. Thanks! I love reading your blog. Its very engaging. I think one of the reason why women want to be skinny like runway models is that, clothes/fashion designer are making clothes that suits these models or store manequin and not for curvy women. Especially in asians shops, its hard for me to find a dress/bottom/top that looks good on me because the clothes they sell, are for the boobless and the buttless despite being in my size. As long as you can walk up a flight of stairs and still be able to breath and smile^^ let your inner glow (^^) shine through!! @algin damn straight to the point. 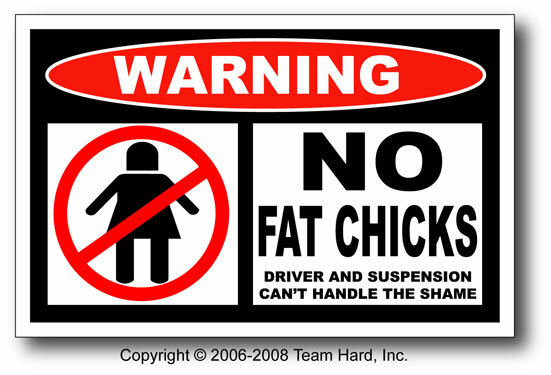 fat chicks need some lovin too! I think it's the more health-conscious, vain men like us who find it hard to balance fat and skinny because we actually care :P I don't think there's a distinction in gender either because there are plenty of too fat / too skinny people walking around happy with the way they are. All down to one's self-consciousness isn't it? That's how I feel anyway. Been reading your posts from time to time, makes for a good easy-going read. Keep 'em up! Some gals try to thin down just to fit in jeans/dresses they USED to have. I dun understand that logic as 1) they buy lotso new clothes anyway and 2) the fact that its USED to wear doesnt mean that they have to wear it NOW. Oh, btw, SCR is halal. sometimes its the clothes! look at most of the clothes that are selling in blogshops these days.. so tiny! haha allison i agree with you, everything is size 6-8 sometimes 10 hardly 12. and the cutting. god it's so small. once i love the dress so much i actual went through a diet so that i could fit in it for a day. silly me. can you like, maybe shove this post to all the skinny girls out there who thinks they're fat? and stuff them a cookie too. they're so annoying i could eat them up.